Getting work done starts with the device we use the most. In my case, and for many others, that’s our phone. It gives us access to an entire world of information and tools that are always within our reach. Since we spend so much time with our phones it benefits us to think about the best ways they can serve us in our goals. This way, wherever you are and whatever you’re doing you’ll be able to get things taken care of as needed with little to no hassle. My ADHD has caused me to spend more hours looking for the answer to the question, “how can I finally get work done?” than I have on actually getting work done. After a few years of searching, testing, and tweaking, I think I’ve found the right balance and the right apps. While I occasionally swap out one of these apps for another as new ones become available, this basic lineup of tools gets me through the day. If you’re struggling with ADHD, this might help you too. Drafts is my commander-in-chief in my battle against ADHD. It effectively acts as a brain dump and processor for all things text. Every time I have something that needs to be written down, I go into Drafts, type away, and then use its powerful Actions system to send it off to whatever app will process it properly. I use it for sending ideas to my writing app or my journal app, plugging events into my calendar, creating new tasks in my todo list, sending out a tweet or Facebook message, and translating text into Spanish or Italian. Capturing text in the moment is the only way to make sure it’s still there before you’ve forgotten about it. And if you have ADHD, you probably will. If you know somebody with ADHD, you probably see them cycle through new ideas constantly, seeming to forget about their last project the moment something newer and more exciting comes to them. For every idea we act on, there are ten that get tossed aside. We often forget about them until months later when we say, “I had THE coolest idea for a screenplay, but…I can’t remember what it was about,” and wonder if we’re losing our minds. I usually carry a Field Notes notebook with me to prevent this, but sometimes a phone is more convenient and it works better when you’re pressed for time. 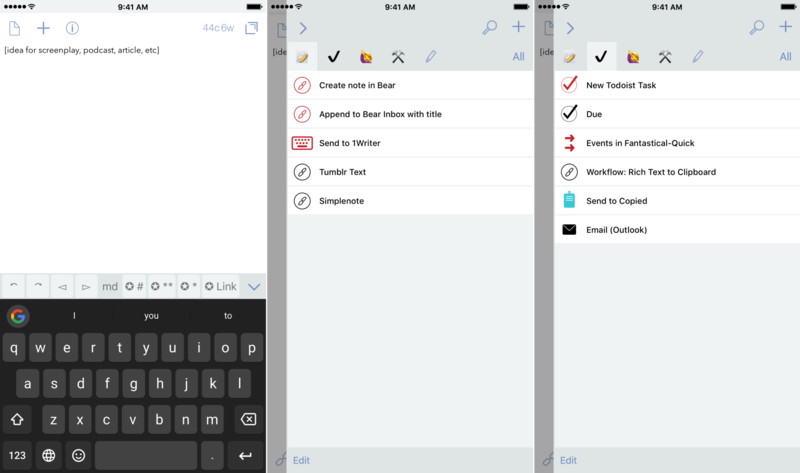 I’ve used several notetaking methods for this, ranging from plain text documents to the stock iOS Notes app, and finally Evernote before realizing that it had lost sight of what made it great in the first place. 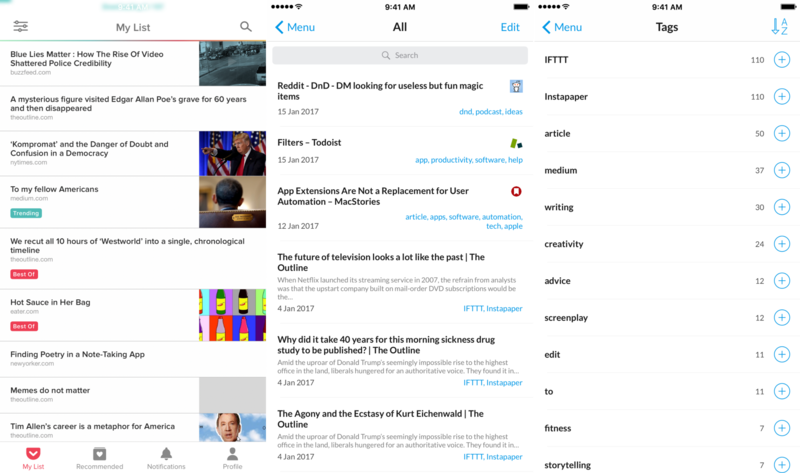 In the wake of Evernote’s recent poor decisions, Bear emerged as a replacement that I’ve found is more than equipped to hold all of my ideas, article drafts, quotes, and plenty of other text-based things I’ll need to access later. Federico Viticci has a great piece that goes pretty in-depth on what makes the app so powerful, but our goal is to get in and get out, so here’s a quick rundown: It supports Markdown by default, so if you’re a writer it makes publishing your work online a breeze. It uses tags to organize, rather than folders, so you don’t have to spend too much time fiddling with organization and it can exist in multiple places at once. Sync is almost instantaneous, so moving from your computer to your phone or tablet takes almost no time. It also has a gorgeous interface that makes spending time in the app pleasant enough to not totally feel like work. The only downside is that it operates on a subscription model, which is more sustainable long-term, but if you can’t spend the extra cash Simplenote is a good alternative. ADHD’s superpower is destroying your focus. Due is the first tool I use to keep me on task and help me stay grounded when my todo list feels overwhelming. 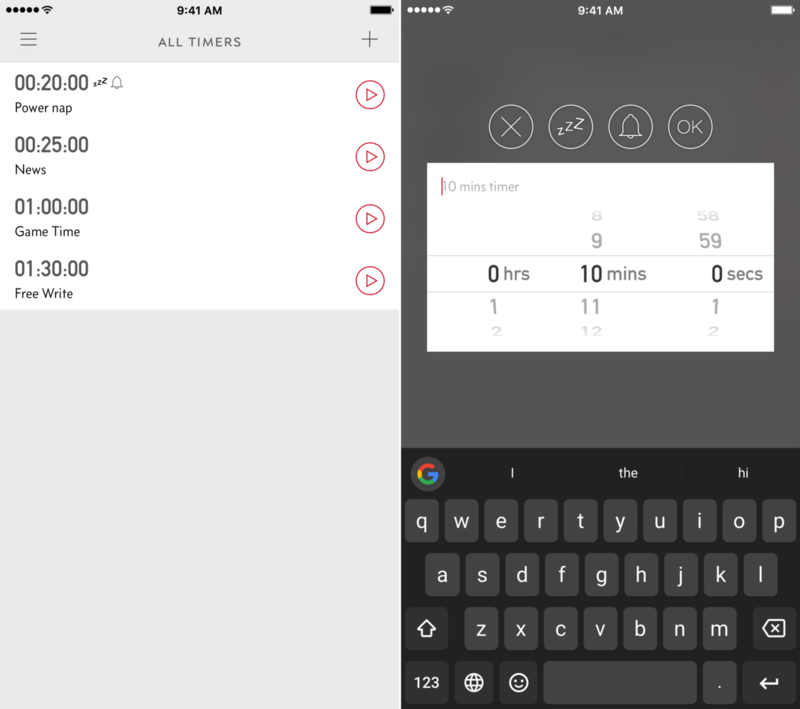 It’s a flexible timer that creates custom tasks with set durations so you don’t spend too much time on one activity. 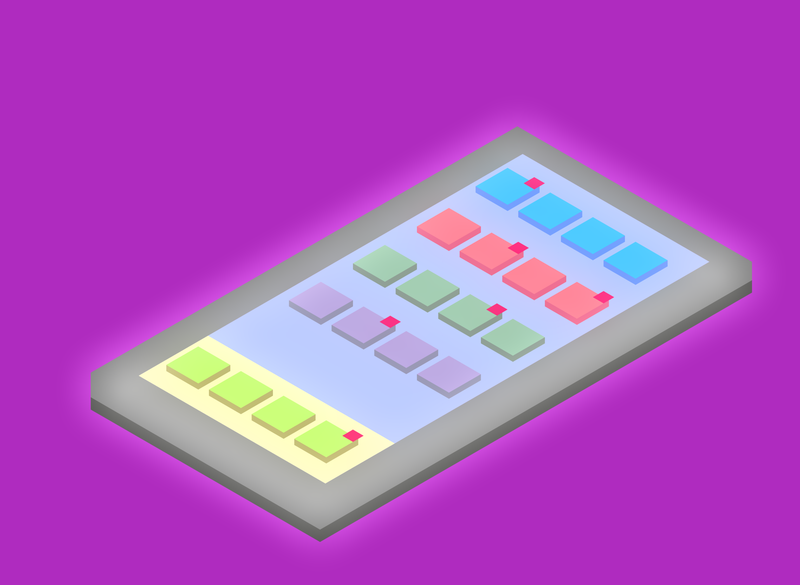 I’ve used this to build a custom version of the Pomodoro method. I look at everything I need to do that day, figure out how much time it’s likely to take, create a timer, and then set aside time after I get through that task to reward myself. I use that reward time to take a quick walk, read an article or two from my Pocket queue, or check in on Twitter to see what I’ve been missing. With Due’s help I’m able to stay on task without feeling overwhelmed and giving myself time to do the things that keep me sane. This might be overkill for some, and it’s a bit pricey at $4.99, so for something nearly as effective and more affordable, I’d suggest Focus Timer or any number of other Pomodoro apps. I’ve mastered the art of walking to a room to do something, only to forget what I needed by the time I’ve gotten there. When you have ADHD it comes with the territory. It’s frustrating, but it’s not a huge problem until it threatens your productivity. That same forgetfulness has cost me due dates on assignments, forgetting to schedule appointments, missing deadlines on job applications, and countless other tasks I’ve since forgotten about because that’s the way it works. The answer to this, for me, was to find a todo list app that showed my tasks in a meaningful and digestible fashion while making it quick and simple to get my tasks into the system. I’ve tried almost every major productivity app on the App Store, and I’ve found Todoist to be the best at keeping my life from falling apart. 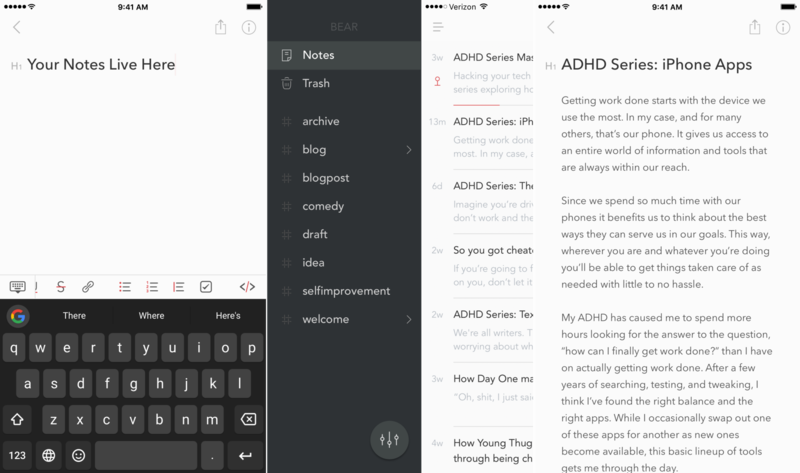 Todoist shines in its simplicity and input handling. Its clean interface makes viewing your tasks at a glance pleasant and avoids being overwhelming. There’s also a karma system that makes completing tasks feel more like an achievement and less like just a check mark on a wall of tasks. While many todo apps offer granular details that can be modified for each person’s unique workflow, these apps often require more time and research to perfect than is good for someone who gets sidetracked easily. Todoist offers enough power to not require one of those apps while presenting it in a way that’s accessible to new users and gets out of the way. Its natural-language input system is leagues ahead of the competition: you can say things like “Publish article tomorrow at 11” and it’ll remind you the next day to hit that publish button. After submitting your task, you’re left in the same input bar so you can quickly begin typing another task. This is great for the times where you’re in a hurry and need to jot down a few tasks at once. Nearly all of this is offered for free, with labels and collaboration costing $30 per year. Most users will find the free tier is perfectly fine, though, so it’s a hard app to beat. Fantastical is the closest I’ve found to the perfect calendar app, though I’m not sure such a thing exists. Its killer feature is natural language input, just like Todoist but significantly more powerful. For my fast-paced ADHD brain, being able to talk to my phone like a human being is invaluable. Instead of spending time tweaking each input box to make sure it’s all exactly right, I just have to say, “Doctor’s appointment tomorrow from 930–10” or “workout every night from 8–930” and it’s taken care of. 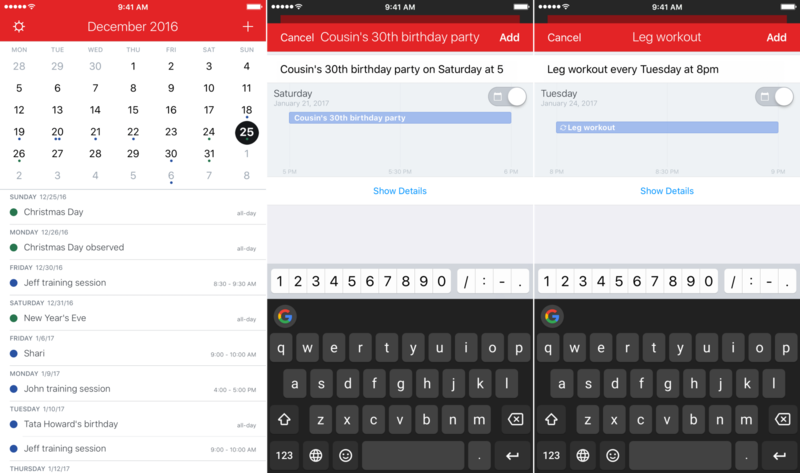 Fantastical makes time management simple by requiring minimal effort to schedule new appointments and let you get back to what you were doing. For a more affordable alternative, Google Calendar offers watered-down natural language input, but has a few perks of its own. A recent update added intelligent habit-tracking, so you can set goals inside the app and Google will figure out where it can fit into your schedule. 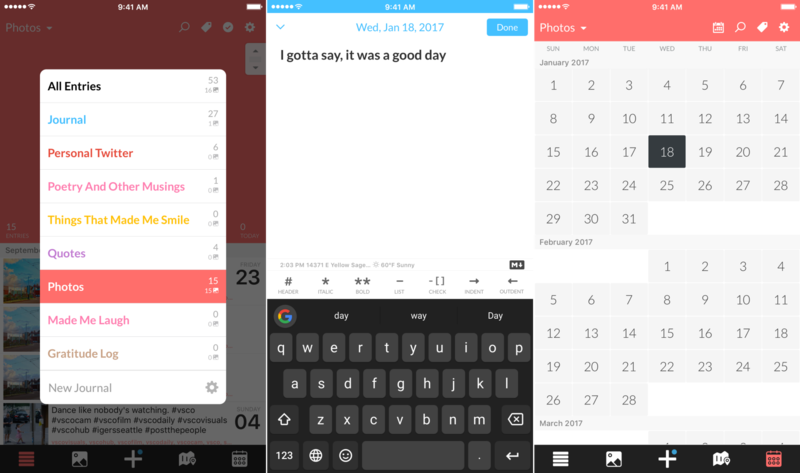 Its week view is also easier to read than Fantastical’s because it takes a visual approach and shows your events as blocks rather than the agenda view Fantastical provides, treating more like a calendar and less like a planner. ADHD can wreak havoc on consistency, and consistency is the key to success. 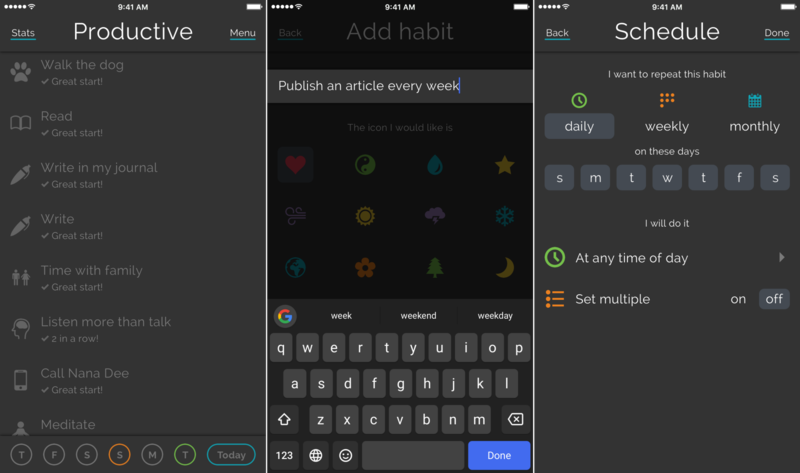 While there’s no magic cure, a good habit-building app can help keep you on track to reach your goals. 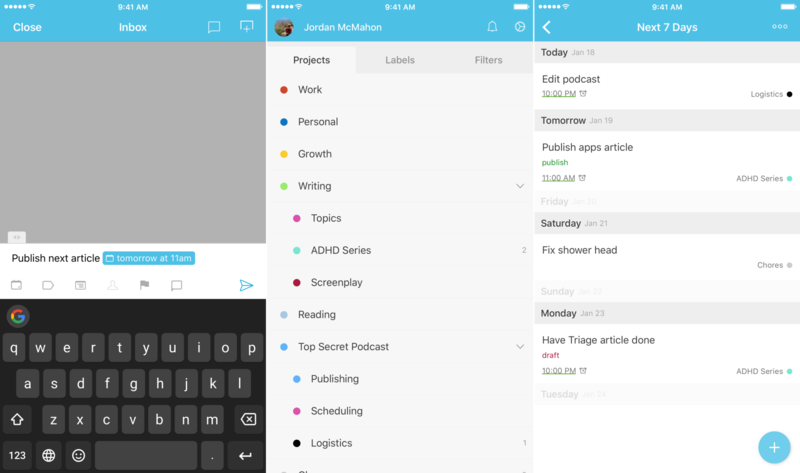 Productive is my favorite due to its elegant and simple design. It also has great statistics for data nerds to see how their habits have improved over time to keep you motivated. The key to Productive, though, is its reminders. ADHD makes remembering things an uphill battle so being nagged by the app every day to call your parents, work out, or write in your journal, can mean the difference between getting things done and continuing the vicious cycle of thinking Today’s The Day I Finally Do That Thing I’ve Always Wanted To Do. I have a lot of trouble articulating my thoughts, mostly because my brain likes to jump from topic to topic and can’t store information very long. Journaling seems like an odd solution, but it can make a world of difference. Setting aside time each day to talk about anything that’s on your mind has the effect of, over time, building your articulation and learning how to get your point across better. Since it’s a private medium you can see how you’ve improved without exposing your thoughts or flaws to the world, which is a huge plus. What makes Day One great is its clean and attractive interface, but its power lies in its multiple journals feature. I have one set up for daily journaling, one for a “personal twitter” to keep my impulsive tweets to myself and avoid embarrassment, things that made me smile, and quotes. It’s like a digital scrapbook that can make you a better thinker along the way. The web is one of the greatest innovations of our time, but it has also been one of the biggest inhibitors of getting work done. For those with ADHD, it’s even worse, because it can make three hours on Reddit or Twitter feel like three minutes. Suddenly, you look up at the time and see you’ve got ten minutes before your essay is due and you haven’t even started. 1Blocker is great if you’re prone to wasting too much time on distracting websites. You can set it to prohibit you from viewing the websites that keep you from being productive. iOS allows this by default, but it’s more finicky and requires changing too many settings. 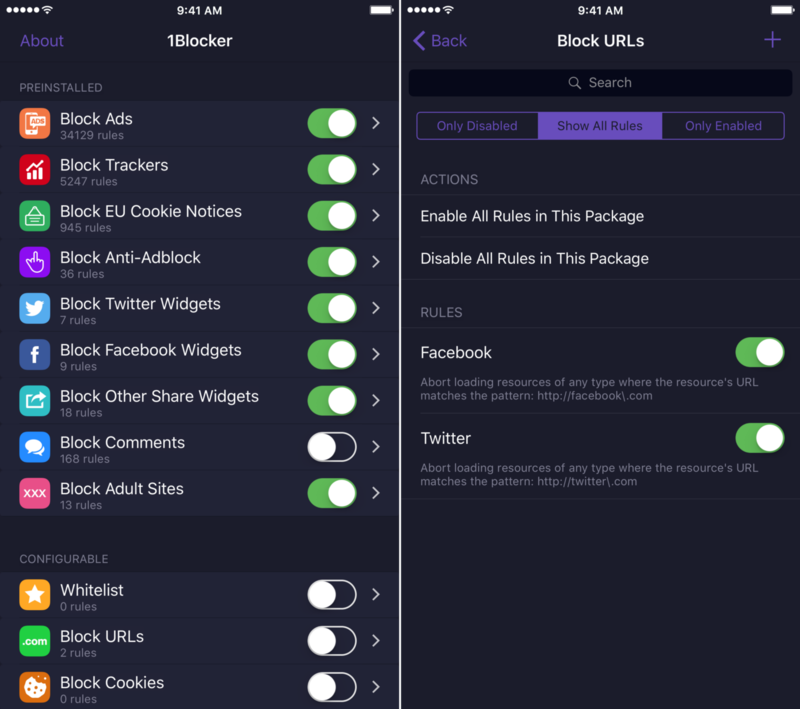 1Blocker makes it simple and has the added benefit of creating a more pleasant web experience by blocking out intrusive and bad ads. That’s standard procedure for someone with ADHD. We love learning new things and seeking out information, but our brains aren’t well-equipped to absorb and retain that information. While that spaciness may always be there, effectively storing and managing your data can make it easier to access the Interesting and Relevant Article You Just Read when it comes up in conversation. While bookmarking works for many people, I’ve found that I need a more robust and manageable solution. I looked for something with powerful search functionality and straightforward organizational capabilities. For the purposes of retaining and easily accessing information, Pocket and Pinner have changed the way my mind operates. I grouped these together because while they serve different purposes for me, they work the same way. Pinner and Pocket serve as archives for links and articles you want to access later. I use Pinner as sort of an extension of my brain to hang onto things I won’t be able to remember but want to have on hand for reference. Pocket is where articles I’d like to read but don’t want to get to while I’m working live. Both have great tagging systems, so keeping things organized is a breeze, and they make sure that article that just taught you a new skill isn’t forgotten once you’ve closed the tab. The unfortunate truth of ADHD is that it’s with you for life. I spent years refusing to accept this and pretending that if I ignored the problem it would eventually go away and everything would be fine. Instead, I was put on academic probation my sophomore year of college because I couldn’t study. The contents of lectures went right through me without resonating and I constantly forgot about homework assignments. My dreams were on the line and I was about to lose everything I had been working for. That wasn’t an option, so I spent the rest of my winter break researching new study methods and trying to find tools to break down the barriers of ADHD and get myself back on track. By the time I got back to school I had found a new way to take notes that ensured I retained more of the material, apps to keep track of my class schedule and assignments, as well as track my grades so I didn’t fall behind. I was able to use these tools throughout my college career, filling in the gaps as I went along and adding better apps as I found them. In doing this and committing to fighting the battle against my condition, I graduated with a higher GPA than I ever thought I was capable of. Since then I’ve been able to maintain a sense of order and control over my life by continuing the practices that I adopted when I hit rock bottom. By no means is dealing with ADHD easy. You’re constantly forgetting what you were working on, struggling to articulate your thoughts well, and finding it impossible to understand or process what you’re reading no matter how hard you try. But that diagnosis isn’t a death sentence. If you seek out the tools and methods that can help supplement your shortcomings, you’ll be able to achieve your goals and reduce the stress that comes with ADHD.